This would be my genuine reaction if I were to ever be blessed with the presence of author, Emily Pan. Well done, Emily, well done! 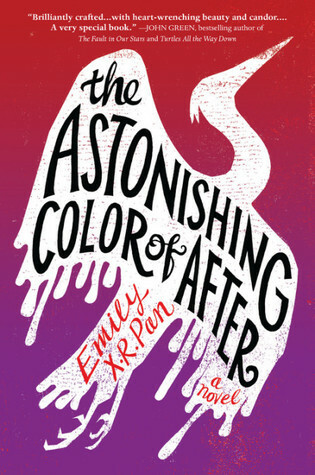 The Astonishing Color of After is one of the best books I've read in 2018...No, wait, it's one of the best books I've read ever. Now that I am done fangirling, let me get serious. The Astonishing Color of After tells the story of Leigh Chan Sanders, a teenage girl that is grieving the loss of her mother who committed suicide. Leigh is a beautiful character. Her artistic personality radiates off of the pages. To see the world through her eyes was quite the reading experience. The book is definitely a colourful read; it's hues ranging from vibrant yellows to the deep, endless shades of black. It tackles the heavy subject matter of suicide and the ripple of it's after effects. The grief, turmoil and all of the unanswered questions. Emily Pan delivers this in a delicate yet raw and honest way. Leigh is angry, she is frustrated and she is desperate. Desperate to found out the why. The author takes you on Leigh's journey to find out the truth and to unravel the phenomenon that is taking place regarding the mysterious bird that might be her mother. The Astonishing Color of After unfolds at a wonderful pace, alternating between past and present. Giving you little pieces of the puzzle to put together along with Leigh. You will be taken on a breathtaking journey, one both haunting yet magical. Emily Pans writing style is enough reason to fall in love with the book. It's lyrical and poetic and flows effortlessly off of the pages. But Pan backs up her writing style with an astonishingly beautiful story about a girl. A girl who is just as desperate to find herself as she is to find out why her mother decided to end her life. You will laugh, you will most definitely cry and you will never, ever forget the extraordinary story of Leigh and her bird. It's getting hard to find a product that is NOT made in China these days, so, though many naysayers will speak out about how the rolex replica watches could have been made in hublot replica uk it is a fact of 21st century life that all this kind of stuff gets made in China. The Chinese have been making resin statues and other products for thousands of years and they do a great job of it and the replica watches sale are no exception. They are shiny, golden, perfectly formed and even have the same heft in the hand as the real deal. The rolex replica are the exact same size and weight as the original trophy and they also come in smaller sizes scale 1:2 and scale 1:16 as well as the miniature key chain FIFA trophy, pendant or "minicord" size. So, if these replica trophies are not in stores, then where can you buy them. They are available to everyone in the world right now from online replica watches sale classified ad sites, like Craigslist, and at public auctions everywhere.